His given name at birth was Muthiah. But when he made his exit from this world, ten years ago at the age of 54, on October 16, 1981, millions of Tamils remembered him only by the name Kannadasan. For Tamils all over the world, he epitomized Tamil poetry. Even those who were illiterate, and who couldn’t read and memorise the poetry of Kamban or the maxims of Valluvan, could hum the compositions of poet Kannadasan. A number count of his publications shows a tally of 109 volumes, which include 21 novels and 10 slim volumes of essays on Hinduism, captioned Arthamulla Indu Matham (Meaningful Hinduism). In addition, he produced about 4,000 poems and approximately 5,000 movie lyrics, between 1944 and 1981; all with an eight grade education at the formal level. He was also an excellent example of this century’s Tamil goliard. What made Kannadasan click? There is no doubt that he had a penetrating eye and keen observational powers. He also did not live a cocoon-type life. He dipped into everything that the Tamil Nadu could offer – wine, women, drugs, gambling, politics, polemics, atheism and religious sanctuary. After enjoying everything, what he did was remarkable – he composed verses about all his experiences, with self deprecating humor and biting sarcasm. These verses touched the sympathetic chords of Tamils from all walks of life – schoolboys, undergrads, housewives, farmers, manual laborers, plantation workers, middle class representatives and even upper class elites. He was at his best when he wrote lyrics on the philosophy of cycles of life. Let me reminisce on some of his most popular compositions in this column. 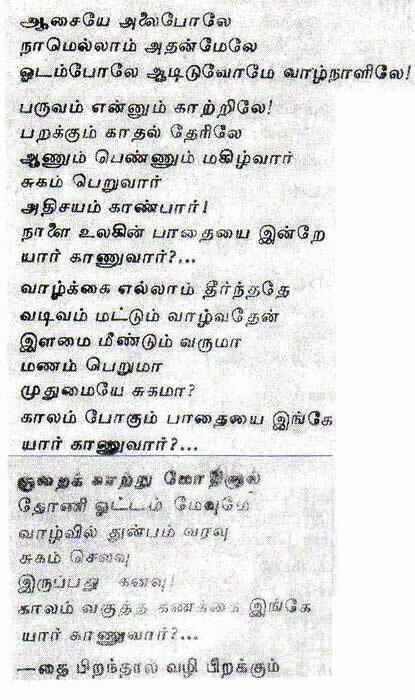 It is a pity that Kannadasan’s verses has not been translated into other languages yet. I have made an elementary effort here, while not attempting a literal translation. Who has lived in this land forever? Where’s the space in this sphere? The birth is credit and death is debit. 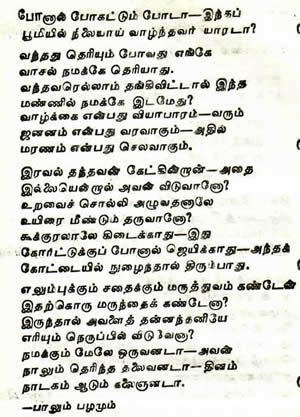 [For Tamil original, please see Kannadasan lyric 1]. Though born without a dress did we come without passions? When we complete the merriment, can anyone carry their possessions? Kannadasan lyric 2 Poonaal Pohatum Poda! Who will come beyond that? [For Tamil original, please see Kannadasan lyric 2]. One of my all-time favorites, is the one which I heard for the first time when I was just six or seven years old. The deep-throated resonating voice of playback singer Tiruchi Loganathan had fixed this Kannadasan lyric, in my mind forever. In our passage of life. Man and woman make merry, enjoy and surprise themselves. But who can guess tomorrow’s path today itself? Even in this lyric, Kannadasan reinforces the theme, ‘sorrows are credit of life, while joys are debit, with the balance being mere dreams, and who can comprehend the arithmetic of fate?’ [For Tamil original, please see Kannadasan lyric 3]. If only Kannadasan had been born in Europe or the USA, instead of Sirukudalpatti village in the Ramanathapuram district of Tamil Nadu, he probably would have become a Nobel laureates in literature and received international recognition. But on the other hand, Tamils would have lost a goliard, who composed lyrics in Tamil for every sentimental moment they experience in life. This item appears in the 50th birthday felicitation volume of Kannadasan (Kannadasan magazine monthly supplement, Sept. 1976) in Tamil. The caption of the piece was ‘Poet’s Determination’. Parasakthi became a landmark movie in Tamil cinema history, because it was enriched by the captivating debut performance by Sivaji Ganesan, script by M. Karunanidhi, direction by duo Krishnan-Panju and songs of C.S.Jayaraman and T.S.Bhagavathi. 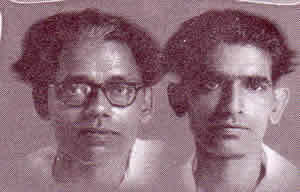 Panju, born in 1915, was 12 years older than Kannadasan. In 1951 when we went to Thiruvarur with Kalaignar [M. Karunanidhi] to write the script for the movie Parasakthi, I became acquainted with poet Kannadasan. Before that, we had listened to oratory in the stages. As he was an intimate friend of Kalaignar, we also became very friendly with him. He also shared the similar sentiments. Initially we were three [Panju always directed movies with his senior Krishnan; as such, including Karunanidhi, he had stated both of them as three.] Then, we became four [joining the three, were Kannadasan.] He was always with us, when the script for Parasakthi was prepared. He had big interest in becoming a renowned script writer and lyricist. He was impelled to excel and exceed the reaches of Narayana Kavi and K.P.Kamatchi, who were the leading lyricists of that period. To stimulate his interest, we solicited a lyric from him for the movie. For some inconvenience, he couldn’t contribute that. However, he was determined to take part in the Parasakthi movie. As such, we offered him a small role as a judge. He somehow struggled and completed that role. Why I have to reminisce all these stories? Its because of my pleasant experience with him. First, he couldn’t write a lyric that was acceptable to many. Then, he had the strongest determination to succeed. He did – not one lyric, but 9,000 lyrics flowed from his tongue. 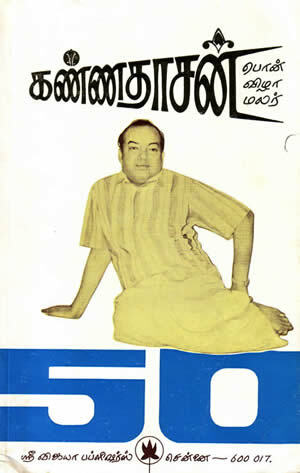 First as an ordinary Kannadasan, then as poet Kannadasan, and finally he had matured into King Poet Kannadasan. All because of his determination to grew up from Parasathi memories. In the garden of 20th century Tamil poetry, like Bharathi, Bharathidasan, Kavimani Thesigavinayagam, poet Kannadasan also had created his imprint firmly. Like this, if everyone had the passion to rise in one’s chosen job, one can become great and our efforts will be talked about. Though the poet had moved beyond the home territory where he grew up, we who were ‘four’ once, don’t think like that. Sometimes, he also feels pleased to meet his old friends. During those occasions, he reminisces the old times. His strength is his open mind, expressing his views without fear or favor. But, in politics, no one can comprehend his mind. We three still believe that poet is our dearest friend. But, it is difficult to fathom poet’s current mind. It is our wish to encourage the poet furthermore, so that his poetry will be of great service to the land.